Chargebee is the right tool for subscription businesses of all sizes across industries, whether you are just a starting company or an enterprise with complex needs. Think of Chargebee as your off-the-shelf, plug-and-play billing solution delivered on the cloud. With Chargebee, you can set recurring billing frequencies and get paid automatically by your customers. You can easily combine recurring, one-time, and usage-based pricing models. It is designed with an elegant and user-friendly API to help you establish tighter integration, as you continue to scale up. The tool provides a flexible and robust billing system to enable your business team to organize special promotions, the right tools for your team to bill accurately, and respond easier for billing concerns, and make it easier for you to collect online payments from the payment gateway of your choice. It also allows you to be on top of things with your operations by giving you actionable data using notifications and reports. In today’s businesses, customers would prefer a simple and user-friendly payment system to have an outstanding shopping experience. 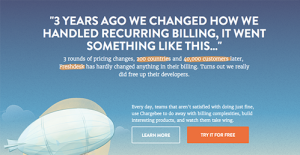 Chargebee is the solution to your billing system. It is a cloud-based subscription billing solution that is comprehensive and at the same time elegant. It has an intuitive interface, letting your sales and support team to handle customer billing efficiently and easily. Chargebee provides small and emerging businesses the option to automate the billing process to run subscription services. With Chargebee, you can automate your recurring billing and quickly be on top of things because the tool allows you to gain a quick snap shot of revenue numbers and user base. It has added features such as flexibility to change pricing, provide discounts, and run promotions without the need to look for a developer. It also automates most of the back-end operations by automating the workflow for invoice generation, payments collection, and follow-ups such as discount management for sales and marketing teams. These services are delivered as a SaaS plug and play solution delivered on the Internet via cloud. Chargebee has a number of payment gateway partners for businesses looking for multiple channels. It can help you readily integrate with the payment gateway of your choice. With Chargebee, you can also customize your email notifications for certain events. The data you give to Chargebee when you use the tool are secure, and hosted in safe data centers. The tool also provides protection against traditional network infrastructure issues such as distributed denial of service (DDOS) attacks, man in the middle (MITM) attacks, among others. What Problems Will Chargebee Solve? Chargebee automates all your billing processes like collecting payments, applying taxes, invoicing, and customer communication, smartly eliminating repetitive tasks. Furthermore, its dunning management feature lets you take care of failed payments through repeat attempts and timely alerts to customers before the expiration of their credit cards. The software provides integration with popular shopping cart, e-commerce, analytics, and email solutions so you can sell your subscription products online, send tailored mails to your subscribers, ship your products, create referral programs, and track user behaviors, among others, all in one place. Chargebee works with 30+ leading payment gateways worldwide, like Stripe, Braintree, etc., and alternative payment methods like PayPal and Amazon Payments, which gives customers an edge to serve their customers globally. It is important to keep in mind that hardly any software in the Accounting Software category is going to be an ideal solution that can fulfill all the goals of various business types, sizes and industries. It may be a good idea to read a few Chargebee reviews first as some services can dominate just in a very small group of applications or be prepared with a very specific type of industry in mind. Others might function with an intention of being simple and intuitive and as a result lack complex features needed by more experienced users. There are also solutions that support a large group of customers and provide a powerful feature base, but this frequently comes at a higher cost of such a software. Be certain that you're aware of your needs so that you purchase a software that provides exactly the features you look for. We realize that when you make a decision to buy Accounting Software it’s important not only to see how experts evaluate it in their reviews, but also to find out if the real people and companies that buy it are actually satisfied with the product. That’s why we’ve created our behavior-based Customer Satisfaction Algorithm™ that gathers customer reviews, comments and Chargebee reviews across a wide range of social media sites. The data is then presented in an easy to digest form showing how many people had positive and negative experience with Chargebee. With that information at hand you should be equipped to make an informed buying decision that you won’t regret. What are Chargebee pricing details? What integrations are available for Chargebee? Pros: I like that Chargebee makes it automatic to collect recurring payment. The app was simple to set up with hosted payment pages without the need for coding. We plan to make better use of their API soon. We have been using the system for about six months and they have delighted us many times. One important help was they had ready support available for VAT regulation changes in the EU from the first day. This reduced the hassle and we were able to use the correct VAT percentages for different countries easily. The customer support is quick and effective and they helped us get the tax numbers to CSV exports quickly. Cons: I don’t have any major complaints. The only minor issue is making Chargebee work smoothly with Stripe. We tried out Baremetrics but it also has issues with Stripe. To be fair, Chargebee offer useful metrics and there is no need for added metrics tools. Pros: I love that I can change all details about Chargebee without the help of a designer or developer. I have checkouts in multiple languages with different currencies. The support agents are excellent and they provide quick replies to your emails to resolve your issues promptly. Chargebee allows me to provide credit card and cheque payment options to my customers as it also support offline payments. This solution covers all possible scenarios in the recurring payments industry. Cons: I have no issues with the software and the vendor listens to our feedback to improve the solution. The only feedback I have now is to have more options available in the analytics section. If you need more information about Chargebee or you simply have a question let us know what you need and we’ll forward your request directly to the vendor.